One can’t help but to be publicly aware of so many things these days. And if you are a walking, talking, breathing, adult, anywhere in the world, you are certainly aware of the current intense interest in the power and persuasiveness of social media. The role of librarians when it comes to helping their patrons negotiate and assess the information that comes from those sources varies greatly depending upon your community, your library, your job. That role, to provide media and digital literacy in a constantly changing world, demands more than ever that we share what we learn and our own expertise. Towards that end, ALSC’s Intellectual Freedom Committee partnered with AASL to host a joint Community Forum on Digital Literacy/Digital Citizenship. If you missed the forum you can access the transcript here or focus your attention on the media literacy section of the ALSC Post-Election Resource. A handy checklist (“cut out and tape near your computer or TV”) provided by WNYC’s On the Media. This resource list from Skokie Public Library includes five downloadable browser extensions to help online news readers identify the accuracy and bias of their sources. On January 24, 2017, ALA Council reaffirmed a 2005 resolution and further resolved to support the critical role of libraries and library workers in teaching information literacy skills and providing sources of accurate information that counter disinformation. Joyce Valenza compiles a wealth of resources for understanding the issues and helping users assess “credibility, reliability, and bias” in this article from School Library Journal. 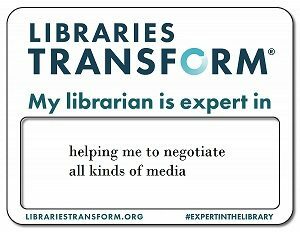 Libraries transform… because we are experts at being aware of trends and issues and willing to share our resources in documents such as the ALSC’s Post-Election Resource. April is the perfect time to get involved and here’s how in the words of ALA president Julie Todaro. The Post-Election resource is a living document, we welcome suggestions and encourage your participation! Contact the librarian referenced at the beginning of the Post-Election resource with your suggestions for edits and additional resources.